For years now I’ve sworn that knitting (and crochet) were enough hobby for me. I have a sizeable stash of yarn, and I don’t really want to acquire all the tools and accessories for a new craft or hobby. I’ve resisted dyeing yarn (for the most part), and spinning, and weaving. I generally find sewing aggravating, so that wasn’t hard to avoid. But a couple months ago I saw a one-off quilting class at my local sewing studio that looked fun. 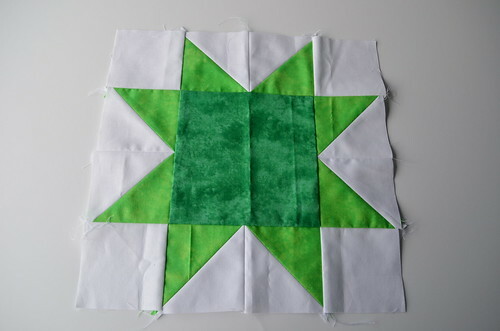 The end result was a couple of pieced squares that you could hang on your wall. Nice and self-contained, no follow-up, basic sewing skills only. So I took it. And… I think I’m hooked. One thing I’ve come to realize is that I like doing things that are both creative and rule-driven. I like to be creative within a set of parameters. For example, I like programming because you can write whatever code you want, but in the end your code has to follow a certain syntax and has to compile. I like knitting because you can create whatever objects you want, but each stitch is made into the stitch below it, and it’s pretty black-or-white when you’ve done something “wrong” (like dropping a stitch). Sewing, on the other hand, makes me uncomfortable because you can sew anywhere on the fabric, there are no lines or rules or anything to stop you from sewing crooked or out of place… it’s anarchy! But quilting, it turns out, has rules. You measure and cut pieces of fabric very precisely and you sew them together in pleasing geometric patterns and the math all works out and it’s very satisfying. Plus you don’t have to do some of the things that I find irritating about sewing (like backstitching over the beginning and end of everything). It turns out that quilting satisfies both my love of organization/things-that-follow-rules and my desire to be creative. So it’s official, kids: I may have a new hobby, in spite of myself. On our recent vacation to Maine, instead of checking out the local yarn store, I stopped by the local fabric store for “souvenirs.” The store—Fabricate—had all its Maine-themed fabrics out front—lobsters, blueberries, forest- and ocean-themed fabrics. (It’s extremely hard to avoid moose- and/or blueberry-themed items in any store in Bar Harbor.) 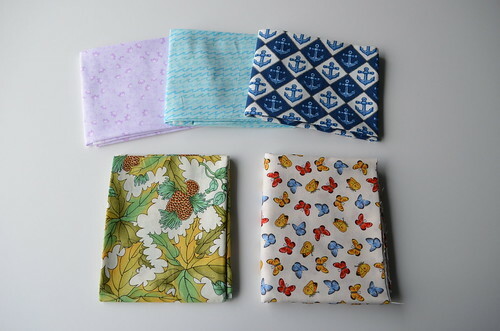 In the end I got these fat quarters, and at the very last second I switched the fat quarter of butterflies out for a half-yard because I liked it so much. 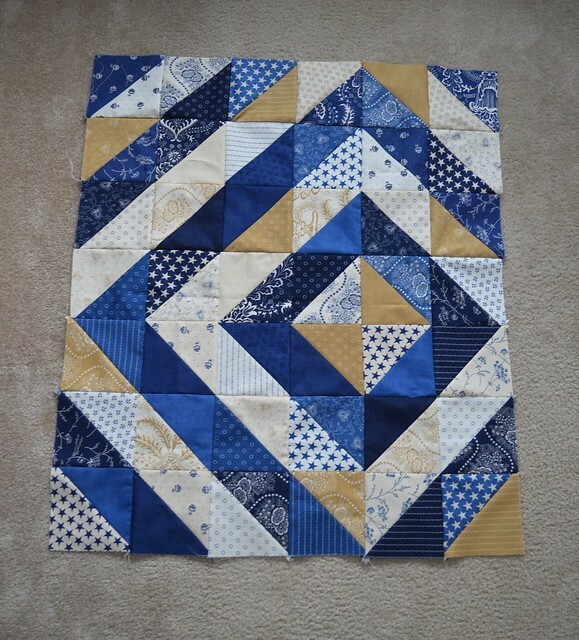 I’m quite curious about the quilting process because I sense that I would like it. That’s why I look the other way because how could I stash fabrics too and get all things needed? !